a collaboration beer brewed with dukes & bell from 92.9 the game atlanta sports radio. click here for a list of locations. (they sell out quickly!) ask for it at your favorite place to buy beer! 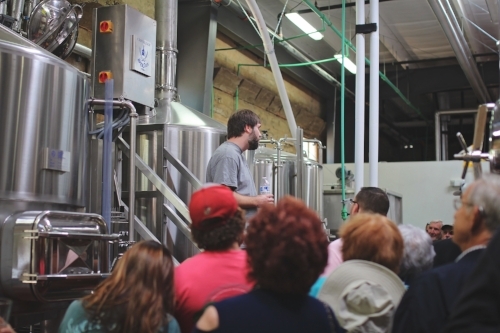 Oconee Brewing Company has a retail production facility and a tasting room for public tours. A 3,600 square foot event space includes an 18 foot high, floor to ceiling, glass curtain wall that opens to an outdoor patio. Additional features of the Brewery are focused on using local resources. The owner of our Brewery neighbor, Farmer’s Feed and Seed, is also in the business of black angus cattle. The spent grain from our production is fed to his herd. The beef comes back to the local market. Farm, to table, to frosty glass of Oconee Brewing Company beer! A collaboration with Brewery 85 in Greenville, SC. Deep orange color. Bready malt flavor. Slight sweetness. Elegant and complex. Moderate malt sweetness. Balanced and smooth. Refreshing and flavorful. Refreshing pale ale. Lots of citrus aroma and flavor. A well balanced red ale brewed with Irish Ale yeast. Malty and smooth. Unique Saison brewed with French Saison Ale Yeast and artfully blended with Blackbird Coffee. Very approachable, easy drinking. Light, smooth, refreshing. We are constantly coming up with new recipes and brewing test batches at the brewery. Ask the bartender in the tasting room for more details. Subtle sweet chocolate and roasty flavor. Very drinkable, medium bodied stout. Clean, crisp, balanced, refreshing. Dryness lingers on the tongue.